Henry V (11 August 1081/86 – 23 May 1125) was King of Germany (from 1099 to 1125) and Holy Roman Emperor (from 1111 to 1125), the fourth and last ruler of the Salian dynasty. Henry's reign coincided with the final phase of the great Investiture Controversy, which had pitted pope against emperor. By the settlement of the Concordat of Worms, he surrendered to the demands of the second generation of Gregorian reformers. Henry's parents were Henry IV, Holy Roman Emperor, and Bertha of Savoy. On 6 January 1099, his father had him crowned King of Germany at Aachen in place of his older brother, the rebel Conrad. Henry took an oath to take no part in the business of the Empire during his father's lifetime, but he was induced by his father's enemies to revolt in 1104, securing a dispensation from the oath by Pope Paschal II, and some of the princes did homage to him at Mainz in January 1105. Despite the initial setbacks of the rebels, Henry IV was forced to abdicate and died soon after. Order was soon restored in Germany, the citizens of Cologne were punished with a fine, and an expedition against Robert II, Count of Flanders, brought this rebel to his knees. In 1107, Henry undertook a campaign to restore Borivoi II in Bohemia, which was only partially successful. Henry summoned Svatopluk the Lion, who had captured Duke Borivoi. Borivoi was released at the emperor's command and made godfather to Svatopluk's new son. Nevertheless, on Svatopluk's return to Bohemia, he assumed the throne. In 1108, Henry went to war with Coloman of Hungary on behalf of Prince Álmos. An attack by Boleslaus III of Poland and Borivoi on Svatopluk forced Henry to give up his campaign. Instead, he invaded Poland to compel them to renew their accustomed tribute but was defeated at the Battle of Hundsfeld, although the existence of this battle is doubted by historians because it was first recorded about a century later. In 1110, he succeeded in securing the dukedom of Bohemia for Ladislaus I.
Henry's primary concern during his reign was settling the Investiture Controversy, which had caused a serious dispute during the previous reign. The papal party who had supported Henry in his resistance to his father hoped he would assent to the papal decrees, which had been renewed by Paschal II at the synod of Guastalla in 1106. The king, however, continued to invest the bishops, but wished the pope to hold a council in Germany to settle the question. After some hesitation, Paschal preferred France to Germany, and, after holding a council at Troyes, renewed his prohibition of lay investiture. The matter slumbered until 1110, when, negotiations between king and pope having failed, Paschal renewed his decrees and Henry invaded Italy with a large army. The strength of his forces helped him to secure general recognition in Lombardy, where archbishop Grossolano intended to crown him with the Iron Crown of Lombardy. At Sutri he concluded an arrangement with Paschal by which he renounced the rite of investiture in return for a promise of coronation and the restoration to the Empire of all Christendom, which had been in the hands of the German state and church since the time of Charlemagne. It was a treaty impossible to execute, and Henry, whose consent to it is said to have been conditional on its acceptance by the princes and bishops of Germany, probably foresaw that it would occasion a breach between the German clergy and the pope. Having entered Rome and sworn the usual oaths, the king presented himself at St. Peter's Basilica on 12 February 1111 for his coronation and the ratification of the treaty. The words commanding the clergy to restore the fiefs of the crown to Henry were read amid a tumult of indignation, whereupon the pope refused to crown the king, who in return declined to hand over his renunciation of the right of investiture. Paschal and sixteen cardinals were seized by Henry's soldiers. In the general disorder that followed, an attempt to liberate the pontiff was thwarted in a struggle during which the king was wounded. A Norman army sent by Prince Robert I of Capua to rescue the papists was turned back by the imperialist count of Tusculum, Ptolemy I of Tusculum. Henry left Rome carrying the pope with him. Paschal's failure to obtain assistance drew from him a confirmation of the king's right of investiture and a promise to crown him emperor. 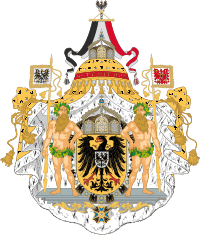 The coronation ceremony accordingly took place on 13 April, after which the emperor returned to Germany, where he sought to strengthen his power by granting privileges to the inhabitants of the region of the upper Rhine. In 1112, Lothair of Supplinburg, Duke of Saxony, rose in arms against Henry, but was easily quelled. In 1113, however, a quarrel over the succession to the counties of Weimar and Orlamünde gave occasion for a fresh outbreak on the part of Lothair, whose troops were defeated at the Battle of Warnstadt, though the duke was later pardoned. On 7 January 1114 at Mainz, Henry married Matilda, the daughter of Henry I of England. The emperor was confronted with a further uprising in 1114, initiated by the citizens of Cologne, who were soon joined by the Saxons and others. Initially, Henry took the fortified town of Deutz, which lay across the Rhine from Cologne. His control of Deutz allowed him to cut Cologne off from all river trade and transportation. At this point, the citizens of Cologne assembled a large force, including bowmen, and crossed the river, formed their ranks, and prepared to meet Henry's army. The Cologne bowmen were able to break the armor of Henry's soldiers; it was summer, the weather was sultry, and the soldiers had removed their armor to find relief from the heat. Henry subsequently withdrew, turned south, and sacked Bonn and Jülich. On his return to Deutz, he was met by Archbishop Frederick, Duke Gottfried of Lorraine, Henry of Zutphen, and Count Theodoric of Aar, Count Gerhard of Julich (William I), Lambert of Mulenarke, and Eberhard of Gandernol, who put up a stout resistance in which the latter was killed. Theodoric, Gerhard, and Lambert were taken prisoner. When Frederick, Count of Westphalia, arrived with his brother, also named Henry, and their substantial force, the emperor withdrew, barely escaping capture. Finally, in October 1114, the two armies met on the plain at Andernach. After an initial skirmish in which Duke Henry of Lorraine was forced to withdraw, the citizen army and the emperor's force of Swabians, Bavarians, and Franconians clashed. The young men of Cologne, including many journeymen and apprentices, created a fearful din of noise, slashing at all who came near them. Theodric threw his force into the fight, and the emperor's army was forced back. Henry failed to take Cologne, and Lothair of Supplinburg defeated his forces at the Battle of Welfesholz (11 February 1115). Eventually, complications in Italy compelled him to leave Germany to the care of Frederick II of Hohenstaufen, Duke of Swabia, and his brother Conrad, afterwards the German king Conrad III. 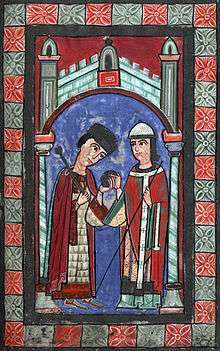 After Henry departed from Rome in 1111 a council had declared the privilege of lay investiture, which had been extorted from Paschal, to be invalid. Guido, Archbishop of Vienne, excommunicated the emperor, calling upon the pope to ratify this sentence. Paschal, however, refused to take so extreme a step. The quarrel entered a new stage in 1115 when Matilda of Tuscany died, leaving her vast estates to the papacy. Crossing the Alps in 1116, Henry won the support of town and noble by granting privileges to the one and giving presents to the other. But Jordan, Archbishop of Milan, excommunicated him at San Tecla. He took possession of Matilda's lands, and was gladly received in Rome. By this time Paschal had withdrawn his consent to lay investiture, and the excommunication had been published in Rome; but the pope was compelled to flee from the city. Some of the cardinals withstood the emperor, but by means of bribes he broke down the opposition and was crowned a second time by Maurice Bourdin, Archbishop of Braga, who was to become Antipope Gregory VIII. Meanwhile, the defeat at Welfesholz had given heart to Henry's enemies. Many of his supporters, especially among the bishops, fell away, the excommunication was published at Cologne, and the pope, with the assistance of the Normans, began to make war. In January 1118, Paschal died and was succeeded by Gelasius II. The emperor immediately returned from northern Italy to Rome. But as the new pope escaped from the city, Henry, despairing of making a treaty, secured the election of the Antipope Gregory VIII, who was left in possession of Rome when the emperor returned across the Alps that same year. Grave of Henry V in the cathedral of Speyer. After the second Italian expedition, the opposition in Germany was gradually crushed, and a general peace was declared at Tribur, while the desire for a settlement of the investiture dispute was growing. Negotiations, begun at Würzburg, were continued at Worms, where the new pope, Callistus II, was represented by Cardinal Lambert, Bishop of Ostia. In the Concordat of Worms, signed in September 1122, Henry renounced the right of investiture with ring and crozier, recognized the freedom of election of the clergy, and promised to restore all church property. The pope agreed to allow elections to take place in presence of the imperial envoys, and the investiture with the sceptre to be granted by the emperor as a symbol that the estates of the church were held under the crown. Henry, who had been solemnly excommunicated at Reims by Callistus in October 1119, was received again into the communion of the church, after he had abandoned his nominee, Gregory, to defeat and banishment. The emperor's concluding years were occupied with a campaign in Holland and with a quarrel over the succession to the margraviate of Meissen, two disputes in which his enemies were aided by Lothair of Saxony. In 1124, he led an expedition against Louis VI of France and turned his arms against the citizens of Worms. On 23 May 1125, Henry died of cancer in Utrecht and was buried at Speyer; his heart and bowels are buried at the Cathedral of Saint Martin, Utrecht. Having no legitimate children, he left his possessions to his sororal nephew, Frederick II of Swabia, and on his death the line of Franconian, or Salian, emperors became extinct. The chronicler Hériman of Tournai mentions a child of Henry and Matilda who died soon after birth. Henry's illegitimate daughter Bertha married Ptolemy II of Tusculum, son of the first Ptolemy, in 1117. Wikimedia Commons has media related to Henry V, Holy Roman Emperor. ↑ James Harvey Robinson, Readings in European History, (Boston, 1904). Found here. ↑ Robinson, J.H. (1904). Readings in European History: From the breaking up of the Roman empire to the Protestant revolt. Ginn & company. p. 297. Retrieved 2014-10-14. Kleinhenz, Christopher. Medieval Italy: an encyclopedia, Volume 1. Routledge, 2004. Gwatkin, H.M., Whitney, J.P. (ed) et al. The Cambridge Medieval History: Volume III. Cambridge University Press, 1926.